Based on the 5-passenger Santa Fe Sport, the 2016 Hyundai Santa Fe crossover SUV provides a 3rd-row seat, standard V6 engine and more sophisticated styling. 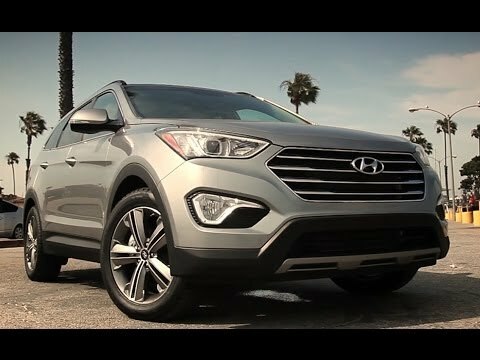 Loaded with features and offering even more on its lengthy option list, the 2016 Santa Fe feels more like a premium luxury model, but its price easily fits into most family budgets. This is how great my Santa Fe is! 2016 Santa Fe. Gray color with chrome handles that make the vehicle look luxurious. Has a very comfortable drivers seat that adjusts to any position you need to drive comfortably. Has 3 different settings of steering so you can relax or tighten up the steering wheel to your liking. Sits 3 people in the back and two in the front. Has a nice dashboard that lights up nice in the night time. It alerts me when there are any doors open, including the back door. Has a spacious back so I can put my baby's stroller and groceries in without issues. The back also has these secret compartments to store more thing in the back. Windows roll up automatically and you can lock the windows from the driver seat. It is really good on gas and rides very smoothly. Great on the highway. Alerts you when your tire pressure is low. Our Hyundai Santa Fe is very reliable. This is our second one that we have owned. When it's time for us to trade again we will definitely buy another one. It holds the road good, its great on the wintery roads that we have up north here, and it's comfortable. It's very roomy, and when you put the seats down it gives you a ton of room when needed. There are a lot of safety feathers actually to many to mention. If your looking for a good vehicle from a trustworthy dealer visit gravy Hyundai in Plattsburgh New York. I have a 7 passenger Hyundai Santa-Fe 2016. I purchased certified pre-owned with less than 1000 miles from a dealership. It has rear view camera on dashboard. CD radio, heated seats, USB ports in front and rear. Third row seating is tight and requires lowering second row seats. Cup holder in middle of seats in second row and on sides for third row. Trunk space is limited when third row is raised. Automatic transmission. Auto seat position driver side.